The Vijayawada Municipal Corporation (VMC) will introduce smart parking facility and identified 29 areas in different parts of the city. The vehicle owners have to pay parking fee online every week, or every month and can park their vehicles at the specified parking lots maintained by the Vijayawada Municipal Corporation. The new system will not only generate revenue to the civic body, but also resolve the traffic problem to some extent in busy commercial areas in the city. Commissioner G Veerapandian inspected some busy roads in the city and announced that the civic body identified 29 areas for smart parking in order to curb traffic snarls on busy roads. He said that people are parking their vehicles both sides of the main roads in the city and causing traffic problems. He said smart parking will be monitored by Command Control Room set up at the Vijayawada Municipal Corporation office. He further stated that denizens have a chance to know about the smart parking areas through internet and smartphone application. "People can know about the real time on and off street parking details, parking fee, open places at parking areas, details of parking places etc.. People can pay through cashless system to prevent misuse of parking fees", he added. He stated that the people should pay the parking fee online, through wallet, debit and credit cards. 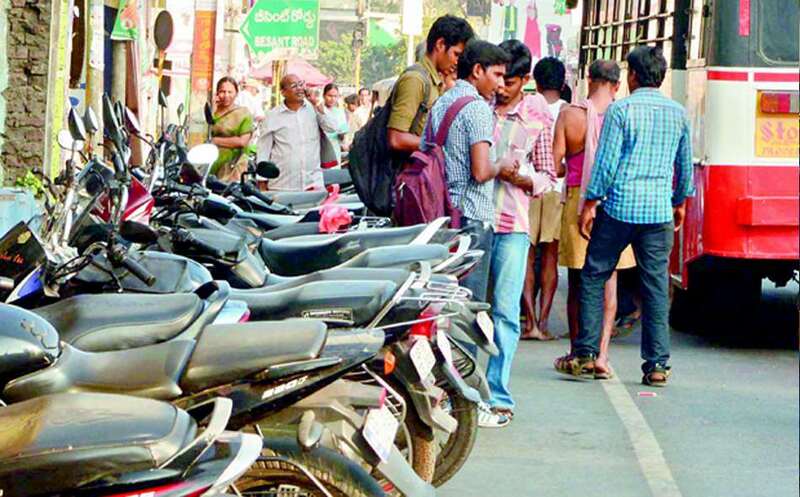 "The Vijayawada Municipal Corporation would provide daily, weekly and monthly passes to the people and people have a chance to park their vehicles at anywhere in the city with the one city card parking pass", he added. He said that the entire parking system connected with the Command Control Room to know about the open places at different parking places and latter the officials would put the details in dashboard regarding the parking place and strength of vehicles at different parking places in the city. "Enforcement officials would take legal action and also impose fine on vehicles owners who would park their vehicles at no parking areas in the city through the CCTV cameras", he added. He said that smart parking system would help for traffic management, monitoring and also enhance the VMC income.